Family tokens are one of the four kinds of token on the Obyte platform. A token economy system is one of the fastest and most effective ways to get kids to follow the rules. Similar to a traditional reward system, kids earn tokens throughout the day. Then, tokens can be exchanged for bigger rewards. Traditional ways of doing this include stickers on wall-charts and tokens such as special marbles kept in jars. Our system uses Obyte wallets on the family members' personal cellphones. Let's pretend the Smart family is Mom, Dad, Bobby, Jane, and Rusty the dog. Jane Smart has a separate wallet for Rusty. 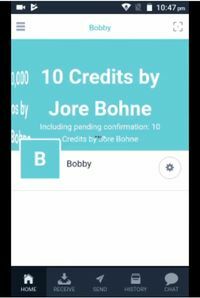 Mom uses some tokens from the fun-coins faucet, or preferably creates 1000 personalised "Credits by Mom Smart" (or whatever), stores them in the "Treasury" wallet, and is mostly in charge of distributing them. It is assumed each of the humans has a smartphone already. If not, they can be bought very cheaply. In ASDA (big UK supermarket), one running Android 7.0 goes for £35, or one running Android 5.1 for £20. Both work perfectly for Obyte, including cameras for scanning QR codes. Use single-address wallets to reduce confusion. Jane: Personal "Jane" plain wallet; "Rusty" plain wallet. Each person has the following named addresses in their wallet address lists: Treasury, Mom, Dad, Bobby, Jane, Rusty. This makes it easy to move the tokens around. It is not essential, but there are benefits if everyone pairs phones with each other. Apart from the encrypted chat, one can then use smart contracts if desired. One party gives the other a pairing code, either written out in full or via QR code. Generate this in Obyte wallet chat by clicking on "+ Add a new device" then "Invite the other device". It will look something like AhHPXCpCSTzD1CF53ELGTAsZ6MCA8Ogvk+koyibfPt/2v@obyte.org/bb#GxVBizZ2DSEf. The other party in Obyte wallet chat clicks on "+ Add a new device" then "Accept invitation from the other device" and pastes the pairing code into the almost-invisible line above the "pair" button. Every transaction that moves "Credits" from one wallet to another will cost maybe 1000 bytes. Make sure everyone has enough. If the kids waste their bytes, they can buy more with regular money. But note that "Credits" cannot be bought for regular money. The exact system of what behaviours earn how many tokens and what rewards these tokens can be exchanged for (family trips to the movies etc) will need to be worked out by the family concerned. See, for example, the Very Well Family website for some ideas. To avoid confusion, it might be best to refer to the tokens handed out to the children as credits (whether the actual name is Credits or Smarts or Woos or whatever), and what they can be "cashed in" for as rewards. Bobby mows the lawn, and Jane does the laundry, each receiving credits per the agreed list. The kids get credits for being friendly to each other, i.e. not fighting, for a whole day. They get the same number to each wallet. The group credits encourage peer pressure: "If we fight we don't get the 20 credits today, so just chill out, all right?" The kids spend their credits on individual rewards: Bobby wants to stay up late to watch a TV show, and Jane wants to try some of Mom's new make-up. The kids cash them in to go on a family outing to the theme park. When credits are earned, per the family system, a parent sends them from Treasury to the kid's wallet. This can include use of a personal oracle, if you wish. When credits are exchanged for rewards, the kid sends the appropriate number to the Treasury wallet. Since all the relevant wallets are single-address, and these addresses are known, everyone can see all the relevant token transactions. The dog is included for family harmony. This page was last edited on 21 January 2019, at 18:14.